The first thing that comes to mind when you hear the opening music to the Wild Cat Canyon Slot is the harrowing classic, Deliverance. Fortunately, the gameplay is more along Tasmanian Devil and Crash Bandicoot lines, which is a much easier spin for the marketing people. The fun gameplay and wild bonuses make it much more of an easy spin for us too. 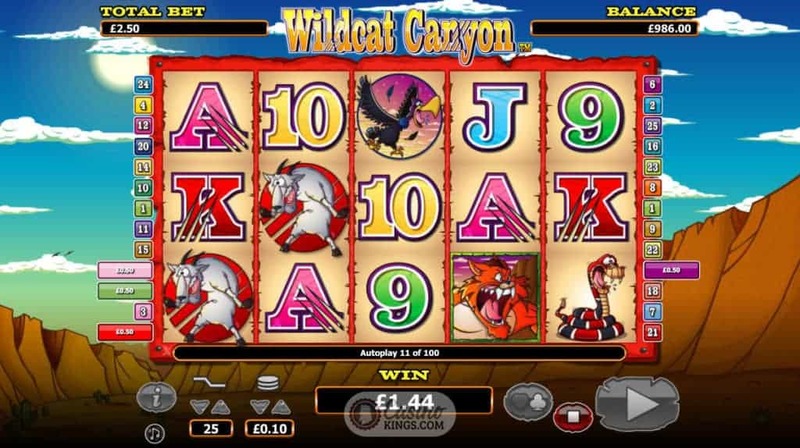 One step inside this slot title and we can tell that this is a light-hearted walk on the wild side. First things first I suggest you have a gander at the game info, not particularly to delve deeper into any confusing game rules – there are none – but more to have a listen to the bending country guitar soundtrack, just one of several sounds that help to maximise atmosphere. Amusing animations like a rattlesnake rodeo-riding a goat randomly skip across the desert background to keep the fun level notched up to 11. 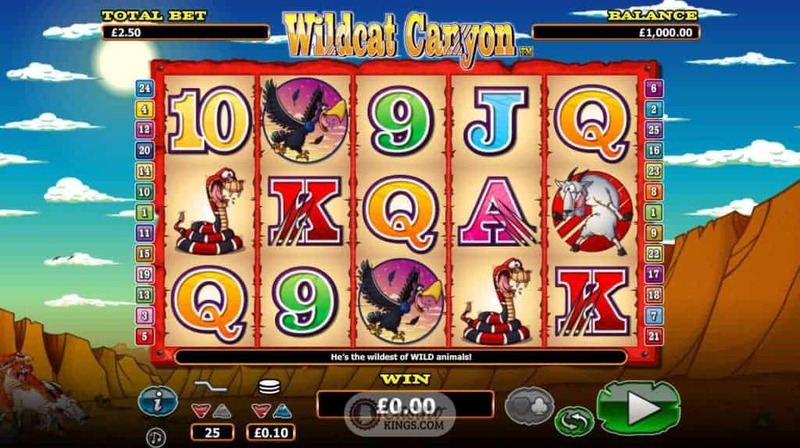 Our buff-looking Wildcat (I mean seriously, this kitty must have found some protein-rich jock tourists to feed on) is the Wild symbol while three or more scatter symbols – the cat’s paw print – launches the free spins feature. During free spins, any reels with the Wild symbol on are held while the other reels are re-spun for maximum win potential. The free spins round itself does have an added twist – players can choose the kind of round they want to shoot for. The Select-A-Play feature allows players to choose either 15 free games with a 3x multiplier on wild wins, 10 free games with a 5x multiplier on wild wins or 5 free games with a 10x multiplier on wild wins. Which one you choose depends on your mood or strategy – do you go wild or tread the fence carefully? This added interaction does offer a surprising amount of intrigue to the game. NextGen have also included a gamble feature – a fairly standard black or red or pick the suit set-up – which may seem par for the course but does elevate the bonus potential to maximise your winnings. 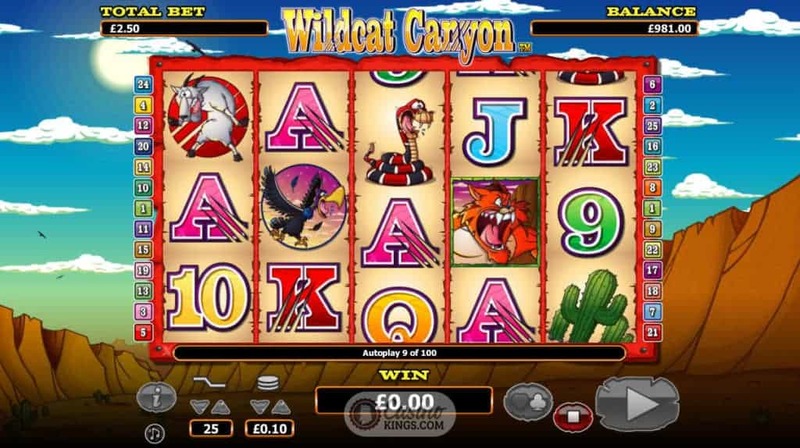 NextGen have provided plenty here for you to channel your inner wildcat and get your teeth into some tasty winnings. 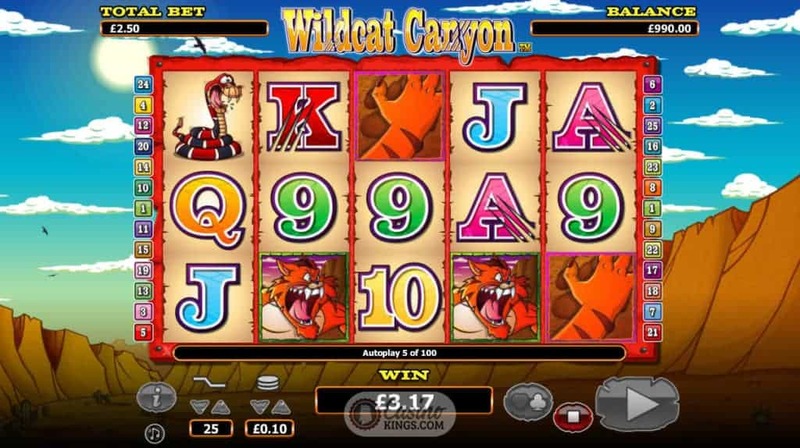 Wildcat Canyon lets you seek out your bonuses with some engaging gameplay, and not a buck-toothed hillbilly in sight. Yee-haw indeed.